Men decide everything about the community’s life. When something must be discussed by the villagers, men meet in the chief of the village’s meeting room. Women don’t have the right to take part in those meetings. Each family sends its representatives to the meetings and it must be a man, even a boy. The decision of the village council will then be announced to the other villagers. This is how all the important decisions are discussed. I don’t think this will change one day because it has been like this since our ancestors’ time. The community is very important here, so men also authorise the marriages. When a man wants to marry a girl of the village he sends an envoy to her father (he and his brothers have the right to decide). The girl is obliged to accept the husband they choose for her even if she doesn’t love him. We have been all married like that. A girl doesn’t choose her husband. Women would like some things to change. A popular song women usually sing contains the line ‘being a woman is an injury’. You have to obey and keep in your mind that you are different from a man. When you divorce your children belong to the family of your husband. A woman can’t be the chief of a family here. Your husband is the chief and you must obey him. People say a woman must be patient and support her husband, even if he does the wrong thing, so that her children succeed. I believe that it is true because it is our tradition. If you become violent against your husband your children will be affected by that later. Men and women don’t have the same rights. Men don’t cook food; they don’t have to go fetch water and firewood. 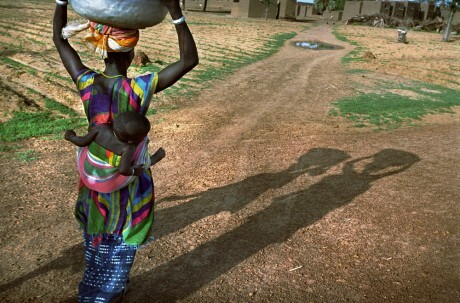 Men work on the land, but women also help them after they finish domestic tasks. Women don’t have the right to possess land here. Farming land is scarce here because people sold their farms to middlemen from Bamako. As women don’t have the right to possess land our collective farm is facing a lot of difficulties. We are obliged to beg for land from men every year. When a man accepts to lend us his land this year the next year he will say he needs his farm. We don’t know how to find a solution to that. We can’t get as much farming land as we would like.